Rather excitingly, British presenter and model Lilah Parsons has collaborated with Yumi on a '60s inspired Parisian' capsule collection for SS16. Featuring over a dozen pieces (of which two can be seen in this post), the collection features feminine silhouettes, pretty florals, vibrant colours and tailored designs - a combination that has got me weak at the knees! 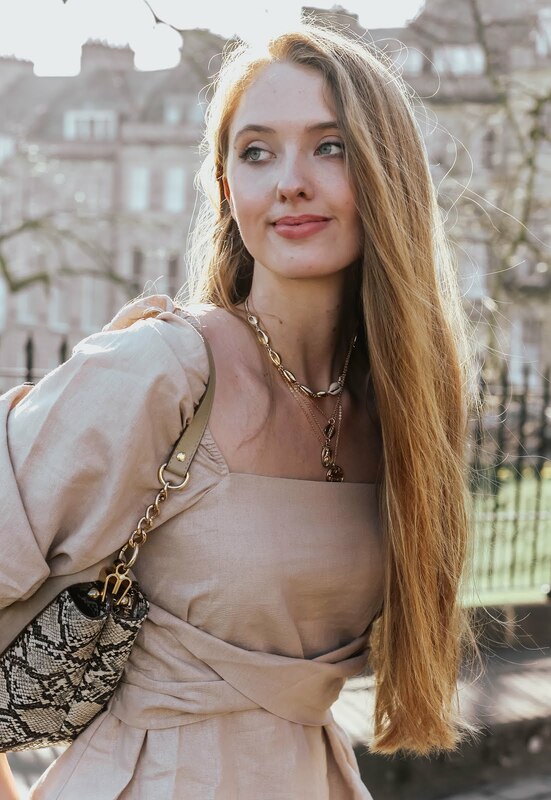 Each of the designs is gorgeously versatile, with each piece looking as though it could be equally suitable to wear at a wedding, as it would a visit to an exhibition! Words can't really express just how much I love this embroidered shirt dress by Yumi. The embroidery is beautifully intricate and has already earned three compliments from separate passers-by! And I feel the same way, there's something pretty lovely about floating around in an embroidered dress. Really though, this midi dress has taken my love for shirt dresses to a whole new level; featuring a button-up design and sheer sleeves, it's quickly become a favourite of mine. Will I be wearing it this summer to play the role of wedding guest? Most definitely. Another piece that has made it into my 'really love and wear far too often' section of my wardrobe, is this chic white classic trench coat by Yumi. I hadn't before considered wearing white as outerwear, however when layered over such a bold shade, the contrast has truly convinced me to think outside the box. Considering how pesky the weather can be in England, I've found it to be quite refreshing having the option of wearing a coat but without looking as though I'm preparing for a downpour and/or blizzard! It's a nod to the season without totally committing, basically. Falling just above the knee, this classic trench coat features a double breasted front, two pockets and more gold detailing than you can shake a stick at. It's undoubtedly been a piece missing from my wardrobe and one that will no doubt solve a multitude of problems as I'm searching for the perfect outer layer for outfits this summer. So, did it rain while I was wandering through the stunning grounds of Exbury Gardens? No. But never let it be said I'm unprepared! Beautiful photography as usual. Love your outfit! So classy! Gorgeous dress. Love the color looks so good on you! Such a chic looking dress! Both the color and silhouette are just fabulous on you Gabrielle! beautiful pics. Also the embroidery of the shirt dress is wonderful! I love your jacket and the fact that it prepares you for the changing seasons without totally committing! You look so gorgeous as always. The embroidery work on that dress is beautiful, I love that shade of reddish orange as well! The fabric and color really are beautiful, and a white trench is surely a timeless piece. I love my trench a lot, even if it isnt half as elegant as yours. You look adorable, I like how your black choker has a little bow, so cute! The gold details on the white jacket and black bag finishes the whole outfit beautifully! I really like the pretty dress and the handbag! Great look dear. Have a nice week. You've really been embodying Summer, in the absolute best way! This outfit is stunning, and so classy. Totally you. The sleeves on that dress, ugh, I need to get my hands on something like that! This post is gorgeous, as usual. This dress is beyooooond beautiful. I absolutely love it paired with the choker too, so pretty! Your photos are always stunning, Gabrielle. You couldn't choose a better location for this shoot. This dress is fabulous. Such a gorgeous shirt-dress, you look amazing and very classy! You look absolutely beautiful, I really love the dress! You always go to beautiful places and you look lovely with this dress! Wow, this look is so beautiful and would be a perfect option for so many different occasions, especially a wedding! I love the details, color and overall fit of the dress, so pretty and flattering! Thanks so much for sharing, beautiful, and I hope you're having a great start to your week so far! What a beautiful dress! You look perfect with the red foliage in the background. Hope you have a great start to the week! You've most definitely got the perfect wedding outfit sorted Gabrielle! The embroidery is so beautiful and the mac is a great accompaniment, especially baring in mind the temperamental British weather! You've also picked such a gorgeous (and apt!) location for this shoot! Gorgeous pictures! I just adore your hair! Your outfit is so pretty too! That dress is so pretty and I love how beautiful it looks on you, Gabrielle. You are the perfect model for it. I even checked the website and they deliver to Canada, yay! That dress is beyond gorgeous! You're so tall the midi length is perfect on you! I love that white trench! I normally would go for a black or another darker color for outerwear, but this white one looks so sharp and clean. I love how it looks paired with that dress. It's gorgeous! Such a beautiful dress <3 Love the location!! Are you up for any collaborations? You look great dear! The dress fit you so well! You look ravishing!!!! This embroidery dress is an absolute dream. I love both its cut and its colour...and no need to tell you how much I love the embroidery detail because I do embroidery myself- and that's says it all. Gorgeous dress indeed...a dress like that one is perfect for weddings and special occasions (but it can also be worn everytime you feel like dressing up a little) !Plus, it is so well paired with that trench coat. Lovely bag and sandals...very elegant styling choices! The location is so charming...exactly whan I imagine England looks like in Spring...pure heaven. I do hope to visit it some time soon. You wear this brand so well! The detail on your dress is just divine - perfect for the location. Stunning as usual! Such a FAB dress! the color suit you so well. "Floating around" is exactly how I would feel in a dress like that! The fabric is incredibly pretty. I am LOVING that dress and that choker that you paired with it! Super cute look and a super cute location! Lovely look! Love the retro parisian vibe :) The pictures are gorgeous! That is a lovely embroidered dress and the gardens too! I am loving that dress, lady- gorgeous on you! Beautiful photos! I'm loving the dress! It's really lovely! The dress is amazing and it truly looks perfect for any event! Also, you look gorgeous! Oh Gabrielle, I love this dress. First of all its red and I love the fabric used. I love the the class and the comfort. Definitely something I will wear. You look beautiful! Great photos! The embroidery on that dress is beautiful! I have a few weddings this summer and I am definitely not ready, haha. Thanks for the inspiration, I'll have to start figuring out what to wear now! And I just adore your hair, so beautiful! So chic ! I really love your photos ! You look stunning! I love your dress!